The thing about The Dark Heroine by Abigail Gibbs, is that once I started reading it, I just couldn't stop. I had issues with the characters and the relationships at times but even when these things annoyed me, I still couldn't bear to put the book down. I really think that that says something important about this book, but it doesn't completely erase all of my misgivings either. 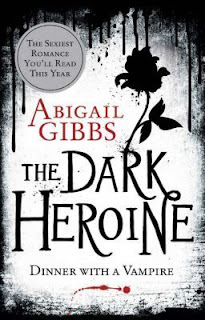 I was really impressed to hear of Abigail Gibbs' writing journey with this book. Writing the majority of The Dark Heroine at the age of 15 is astounding! I hope that inspires many more young writers. I can tell you, I wasn't convinced by the romance element of the book right from the beginning. This book begins with our main character, Violet, who on a night out in London with a friend witnesses this horrific mass murder. A small group of people kills a much larger group of people and it's violent and bloody and I was horrified reading it, let alone witnessing it like Violet does. When the leader of the winning group notices that Violet is a witness to this whole spectacle, he kidnaps her takes her back to his home in Kent. There Violet learns that she's just been kidnapped by a prince of vampires and will remain hostage indefinitely. That right there? That whole description and scenario of the beginning of the book does not scream romance to me. I felt a little bit uncomfortable regarding the whole premise of the book. I didn't much care for Kasper in the beginning. There isn't a great deal likeable about him. He is constantly unpleasant towards Violet, threatening her and biting her against her will and his actions really made my skin crawl at times. Towards the end of the book, I found myself changing my mind about Kasper at times and as long as I tried to view him in the way Violet does, I found myself not loathing him as much as at the beginning. I came to realise my biggest problem with this book isn't so much the romance or the way in which Violet ends up in the position that she does. My biggest problem with the book is that Violet has no other options aside from Kaspar. She has no friends throughout the book, she has no family members besides a father and sister that are barely spoken of, she has no support other than that of the strange quasi-relationship she has with Kaspar. And I really think that these sort of relationships, with friends and family, would have made Violet more human in my eyes. Because as it is, Violet in this book is a bit empty. She has occasional bursts of rebellion and can come out with some funny and sarcastic comments and things, but I had very little sympathy for her as a character. What is a shame, and this is a slight spoiler, is that there was scope to give Violet a friend and a sister-like figure, but they are instead turned into yet another thing that leaves Violet completely alone. Towards the end, as we learn a little more about the vampire world-building and of this strange prophecy of the dark heroine, I found my interest returning. I was definitely more intrigued by this added layer to the vampire/supernatural creatures world than I was with the romantic goings-on and other character relationships. I found this entire book to very strange. Because as I mentioned at the beginning, even though I had numerous issues with this book, at no point did I consider giving up on it. There is definitely something about this story or the way in which it is written that grabbed me. Problems or not, it is still a 500 page novel, and I read the entire book in a short amount of time. This sounds great! I'm looking forward to reading it now, hopefully I can get past the problems with the relationships. I've wanted to read this book for a while after hearing about it but forgot the name- I shall have to try it out now!